For me, one of the first signs that winter is here takes place at the grocery store. I’ll stop on the way home to pick up a thing or two, and proceed to the automated self-scan…not because I don’t like people, but because they’re the closest to the exit and, while I DO actually like a LOT of people, I REALLY like dinner. Anyway, the drop in humidity that comes with colder temperatures outside leads to what the buried-wire pet containment folks call a “mild correction” when I touch the self-scan terminal. I won’t rehash my disdain of cold weather (like I did here, here, here, or here) and while those nuisance static shocks aren’t at the top of the list of reasons why, they actually can be quite severe in other cases. For example, the minor jolt you get from touching a grounded terminal after pushing a rubber-wheeled shopping cart over the vinyl-tiled floor of the produce aisle isn’t near as bad as the shock that a plastic extrusion machine operator gets when he touches a conveyor duct carrying hundreds of pounds of plastic pellets per hour. Why one is so much worse than the other? To fully understand the answer to that question, we’ll need to better understand how static charge is generated. 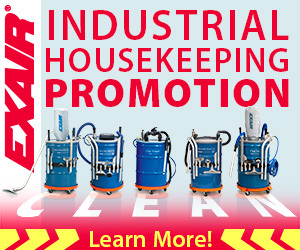 Scientists have been studying the phenomenon since at least the 17th Century, and studies continue to this day of its creation (mainly at universities) and control (right here at EXAIR Corporation.) Simply put, when two solid surfaces touch each other, the contact can result in electrons in the outer valences of atoms on one surface to “jump ship” and end up in the outer valences of atoms on the other surface. Separation of material – lifting the top sheet from a stack, peeling off a protective layer, or unrolling plastic film, for example – can also cause those weaker-held electrons to leave one surface for another. Some processes involve surface contact, and separation. And more contact, and separation. And oftentimes, one surface is in relative motion with the other…and that’s what REALLY puts the “tribo” (“to rub,” remember?) in “triboelectric effect. The constant motion of these plastic jugs on the conveyor (left,) generated (and multiplied) a static charge so great, it resulted in adhesive labels folding or wrinkling while being applied. A pair of EXAIR Super Ion Air Knives (right) solved the problem. These are just a few examples of the mechanisms behind, and the solutions for, static charge. 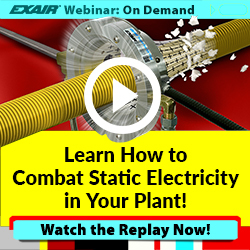 For more details, I encourage you to read EXAIR’s Basics Of Static whitepaper (registration required) or watch our recorded Webinar: Understanding Static Electricity. If you have a static problem you’d like help with, give me a call.